Having seen two references in the past two days to the Alia Ansari's tragic death, I feel compelled to take note of the speculation that Ansari's death was a hate crime or was due to her wearing hijab. These statements are made with no basis in fact, yet they are repeateded by many so-called Muslim leaders and non-Muslim liberal sympathisers. These speculations are apparently believed by many Muslims (and Harvard student filmmakers). Many Black civil rights leaders (i.e., Jesse Jackson, Al Sharpton) make a might fine living off the minority grievance industry, but they're being surpassed by the grievance industry of Muslim organizations such as CAIR and MAS. The Alia Ansari case is a perfect example of pimping a tragedy, twisting the truth to score grievance points, and passing off rumor as truth. The world goes on, even as I'm glued to EWTN. "Over the past few years, Harvard University has received millions in endowments from rich Saudi and Emirate sheiks. Now it's returning the favor by Islamizing its campus and promoting the Shariah agenda of its new Arab masters." "....And this weekend it hosted a $400-per-person conference on Shariah finance led by officials from Saudi Arabia and the United Arab Emirates. The goal of the forum — sponsored by Harvard's Islamic Finance Project — is to 'integrate' Islamic finance into the mainstream economy." "...Shariah-compliant investments are monitored by paid Shariah law advisers who must 'purify' certain returns by donating them to Islamic charities — including some that promote jihad and support suicide bombings." "With $800 billion already in Shariah assets — and $1 trillion to $2 trillion in Arab petrodollars annually looking for an investment home — the potential for billions being siphoned off for terrorism is real." "This, of course, would be a serious criminal violation of U.S. law. Yet Western bankers, including many on Wall Street who are jumping into the Shariah finance market, don't know this." "the Islamic Finance Project of the Harvard University Law School’s Islamic Legal Studies Program will present the Eighth Harvard University Forum on Islamic Finance in Boston, MA. The Center for Security Policy has challenged Harvard on the grounds that this Forum will provide NO information about the serious risks that Shariah-Compliant Finance (SCF) poses for U.S. financial institutions, ordinary post-9/11 investors and the national security of the United States of America." "To counter this silence on the true nature of Shariah, and to expose the risks of Shariah-Compliant Finance, the Center for Security Policy will present a lunchtime panel discussion on Thursday, April 17 from 12:00 – 1:00PM in Pound Hall, Room 107, Harvard University, 1563 Massachusetts Avenue, Cambridge. Media is invited to attend. Sandwiches and drinks will be provided." Speakers at the panel discussion will include Frank Gaffney, President of the Center for Security Policy, Manda Ervin of the Alliance of Iranian Women, members of the Harvard community and others. It will also feature an audio statement recorded for the event by psychiatrist Dr. Wafa Sultan, a courageous opponent of Shariah law and Islamist extremism. Dr. Sultan has been forced into hiding in America due to threats against her made by Sheikh Yusef al-Qaradawi, head of the European Council on Fatwa and Research and a driving force behind the 20th Century invention of Shariah-Compliant Finance. A written copy of her statement will also be available at the event. ....with a varied panel of speakers indeed, including Camille Paglia (keynote speaker), Wendy Shalit, Jennifer Roeback Morse, Zainab Al-Suwaij, Christina Hoff Sommers, and many others - what gives? At Harvard?!?! ?T The official title is A Genuine Debate with a DIVERSITY of views on the Legacy and Future of Feminism. The opening lecture is Thursday, April 10 at 8 PM, and there are several panel discussion on Friday, April 11, from 9 to 5. Looks great, and it's open to the public and free. Check out the program here. Panel discussions on Friday are held at the GCIS South Building, 173 Cambridge Street, Rooms S-020 and S-030, concourse level. What's going on at Harvard? One can barely keep up with their obsession for all things shariah. Last month, there were four lectures there on shariah law, two sponsored by the Harvard Divinity School, one by Harvard Law School, and one by the Harvard Islamic Society. There were probably more, but who can keep track? There are write-ups about the lectures and lecturers here and here. The criticism of shariah at these events seems to come from Muslim professors and activists who've lived in countries where shariah law is practiced. The supporters for shariah seem to largely come from American-born Muslims, converts, and their so-called progressive supporters. How do the "progressives" manage to overlook the illiberal and regressive aspects of shariah, in inheritance, child custody, divorce, testimony, religious freedom and individual rights? I suppose the same way that international banking firms are overlooking it too. Next weekend, Harvard hosts its 8th International Forum on Islamic Finance, April 18-20, 2008. Friday is an all-day workshop on microfinance, and a variety of topics are discussed on Saturday and Sunday. There's a "Video of Select Shari’a Scholars’ Views on Innovation and Authenticity (Exclusively recorded for the Eighth Harvard Forum)." I hope that goes up on the IFP website. Also Harvard's own William A. Graham, Acting Dean of the Harvard Divinity School, will close out the forum with a talk on Misconceptions about “Religion and Politics” in Islam. 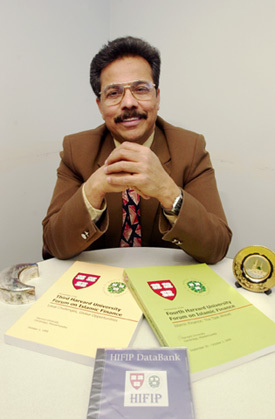 The project director of Harvard's Islamic Finance Project is S. Nazim Ali. Interestingly, Nazim Ali is not an economist, his background is in computers (photo below from Harvard University Gazette article). Ali is also active with the Islamic Society of Boston (ISB) and the Islamic American University (IAU). The IAU was started by Salah Soltan in Columbus, Ohio, and is a subsidiary of the Muslim American Society. Basyouney Nehela of the ISB opened an IAU branch in Boston last year, which offers online and classroom courses in such subjects as Scientific Miracles in the Quraan and Arabic language. MAS's website states that "The IAU board of trustees is headed by internationally renowned scholars such as Sheikh Yusuf al-Qardawi who serves as chairman and Dr. Jamal Badawi who serves as vice chairman." Jamal Badawi is the newest ISB trustee, brought on about a year ago. Qaradawi is still a proposed trustee of the ISB. Gosh, you just can't talk about any leaders of the Boston area Muslim community without getting into MAS, Muslim Brotherhood, Yusuf Qaradawi, etc, etc. The linkage is pretty amazing. We seem to have many "underground Islamists" in Boston. Nazim Ali reportedly helped former Worcester imam Hamid obtain a visitors visa to come to the U.S. in 2001 to attend the Harvard's Islamic Financing conference. Hamid (AKA Muhammed Hamid, Hafiz Hamid, Hamid Mehmud, Hamid Mahmud, Hamid Mehmood and Hamid Qureshi) returned to Pakistan after the conference, then came back and was miraculously apppointed imam of the Greater Islamic Society of Worcester. Miss Kelly readers know about Hamid's relatives (Hafiz Saeed, Muhammed Masood, Abdul Hannan), you can read about them all here. Hamid scampered out of the country in June 2007. Little birds have told me that Hamid was being investigated for visa "irregularities" and he decided to high-tail it back to Pakistan before any criminal indictments came his way. Work visa, anyone? Finally, Syed Nazim Ali filed a lawsuit against the US government on February 20, 2007, because his naturalization application was delayed. It was filed in California court Central District court. It looks like the lawsuit was dropped in May 2007 in exchange for taking care of the application within two weeks (PACER file 8:2007cv00216). Why did he file it in a California court when he lives in Massachusetts? Looks like Syed Nazim Ali is a U.S. citizen now. Who will he bring over next? Enough about Syed Nazim Ali and our many "underground Islamists," what about shariah financing? Why should we be concerned? It seems to me that Western secular societies have no business promoting a religious-based financial system. Why would we go there? It's contrary to the very core of our society, the separation of church and state. Why would we support a financial system based on a legal system that has institutionalized discrimination against non-Muslims and women? The answer, of course, is that there's money to be made, and Western bankers only see green. Short-sighted, to say the least. Deadly too, as shariah financing is no doubt financing terrorist activities. "Critics see sharia finance as a massive subversion campaign by radical Islam designed to legitimize sharia in the West, to undermine our markets, and ultimately to imperil our free-enterprise system and national security — all the while exposing banks to financial risks that make the sub-prime fiasco look like a walk in the park. For its proponents and ideological enablers — such as the well known suicide-bombing advocate, Sheikh Yusuf al-Qaradawi — sharia finance is nothing less than 'Jihad with money.' As al-Qaradawi explains, 'God has ordered us to fight enemies with our lives and with our money.' Unfortunately for Wall Street, it’s hard to argue with the good sheikh on that score. Far from being a guide to ethical investment, sharia finance is indistinguishable from sharia itself." There's that rascal Qaradawi again! "Far from being a legitimate investment vehicle, sharia finance facilitates religiously sanctioned support for terrorist organizations — as well as providing radical Islamists with highly paid sinecures as sharia-finance board advisors in the sanctum sanctorum of capitalism, all the while that they are pursuing a subversive campaign to destroy it." "Predictably, none of this is even remotely disclosed by any of the dozens of Western banks promoting sharia finance today, which obviously exposes them to huge non-disclosure risks ranging from fraudulent misrepresentation, to material support for terrorism." Now there's a lawsuit I'd like to see: US DOJ versus Dow Jones!